These fields will store information about original resource directory. In the unpacker we will store them in PE file header after unpacking sections data. But this is not all yet. We pack the data of all sections by assembling them into one large block, including resources. Icon and version information are lost from file, if they existed. It may not run at all, if it had some specific manifests in resources, which set up rights or libraries required to launch the file. We need to place original main application icon, version information and manifest next to packed data in new resource directory, and write a pointer to it to PE header. These three kinds of resources should be placed unpacked to a new resource directory. 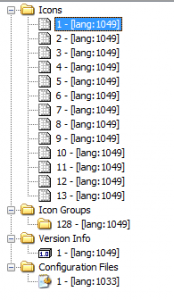 We get the first icon (actually, the icon group) from original file, it is used by Windows as main file icon. File always has one manifest, and it describes, which rights are required for file to launch, and which DLL files are used. Other information may be stored there. Al last, version information - this is actually information about file, which also can be viewed in Windows Explorer. As you can see, the resources are organized as a tree structure. Root directory recordings begin with resource type ones. They nest directories with recordings containing resource name or ID, and they, in turn, nest language recordings directories. Last ones contain data directory, which points to resource data. So, the code above lists all the icons with name or ID. We look for first icon because all PE file resources are sorted, and named resources come first, followed by resources with ID. It will be the first icon of application, and we add it to a new resource directory, keeping its name/ID and language. We process manifest and version information in a similar way - all files have no more than one such recording, and they are always unnamed, i.e. having ID, so we get and save first manifest recording and first version information recording. The fact is that all rebuilders in my PE library will automatically strip all null bytes from the end of the section, into which rebuilt imports/exports/resources etc. are placed, if that section is last in the file. This is an absolutely adequate behavior, which allows to reduce the file size within the limits of file alignment, as the loader will restore null bytes anyway, but in memory, in number of [aligned virtual section size] minus [physical section size]. Thus, if any structure within section ends with null element (for example, final import table descriptor), it will not be physically saved to file, if this import table is placed in last PE file section. By the way, some interesting bugs in editors like CFF Explorer are associated with this fact. It relies on physical file data only, not on virtual. Therefore it can display import table incorrectly with stripped null bytes in its end. Now we need null bytes related to import table not to be stripped, as we are going to place resources right after imports. If we strip these null bytes, then resource directory will be placed over import directory, as a result we will get total crap. Everything is clear here - if there are any resources, we save them to a new PE file. We place them at the end of added section, right after imports. Because this section is the last at the moment of resource rebuilding, it will expand automatically. 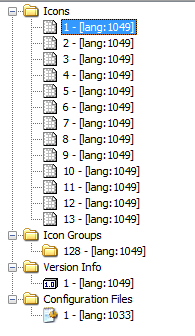 So, one icon group with several icons (application icons), a manifest (configuration files) and version information remain. Of course, the packed file successfully runs!